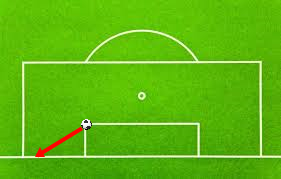 So during a soccer game I refereed, a kid took a goal kick and somehow managed to kick the ball out of bounds before it left the box, like in my beautiful diagram below. Would this be a redo of the goal kick, because it never left the box, or would this be considered going out of bounds, and would be a corner kick? This is a retake. The ball was never put back into play. it has wholly passed over the goal line or touchline on the ground or in the air. which despite not being logically equivalent to the original text, is the only possible interpretation that doesn't lead to absurdities e.g. considering the ball as in play yet having wholly passed over the goal line. If the ball does not leave the penalty area or is touched by a player before it leaves the penalty area the kick is retaken. For any other offence the kick is retaken.